The DEC has issued this revised draft of drilling regulations, without issuing a complete set of HVHF regulations, the dSGEIS. These drilling rules are so lacking in environmental safeguards that they are an argument for prohibiting fracking town by town, if not the state. The DEC has issued these drilling regulations irresponsibly and unlawfully - prior to the completion of the dSGEIS. The DEC missed the one year deadline for issuing the dSGEIS which is subject to SAPA, and have not disclosed information on the extension. The first thing to do is call on the DEC to re-open the dSGEIS for review, before proposing revisions to the drilling regulations. These drilling regs. will be open for public comment until Jan 11, 2013. Respond either online or via snail mail as described below. We encourage you to read the regs. and craft your own responses, but you can use this site as a reference when you go to make your comments. Or read the commentary on this Wiki site and use that to craft your own response to the DEC.
We encourage you to respond on as many of the proposed regulations as you can. Focus on Section 560 which addresses horizontal hydrofracking of shale. Use these comments as a guide to craft your own response. Form letters and phone calls will not suffice. These proposed drilling regulations may become the de facto industrial land use plan for any town that does not have its own land use ordinances. There is no "science" involved, no health or environmental considerations. These drilling regulations do not address the cumulative impacts of gas gathering lines, gas field processing plants, or gas field compressor stations. If your town has not adopted a road use ordinance and land use ordinance to address fracking, it should do so. Vote in a town board that will adopt such ordinances, since it is the board's obligation to protect the town's surface uses, citizens, and drinking water sources. There is no autonomous environmental oversight of fracking regulations in New York. The DEC does not follow ECL 23, it has changed "regulate oil and gas" to "promote oil and gas"
The proposed 2012 regulations allow shale gas wells 500 feet from an "inhabited dwelling"or "place of assembly"
There is no setback for office buildings, stores, etc. - they are not "inhabited dwellings". Likewise most buildings are not "places of assembly" as defined in NY codes. "Place of assembly" is defined as a public meeting hall, which means there is no gas well setback from a factory, school yard, playing field, public park, etc. Although a shale gas well can clearly be permitted next to a school yard, etc. the DEC's pat response has been "We would never do that." If they would never do that, then it should say so in these regulations as named protections in Section 560.4. The "spacing unit" well setbacks are based on mineral rights - surface rights are ignored. If the the surface owner does not own the mineral rights, the well could be on their property. This is emblematic of these drilling regulations' lack of protections for surface property rights. 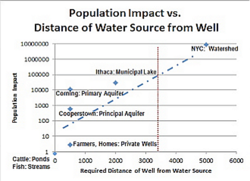 The setback from a water well is only 500 feet - close enough to gas most Upstate wells. There is no science to indicate that a 500 foot setback will prevent water wells from being gassed. If the resident does not own the mineral rights, or is compelled to participate under Compulsory Integration, the lateral section of the well can go right under the house or water well. Those setbacks are about half of what is common in most municipal zoning ordinances in other states. The proposed setbacks will insure that people will be gassed from drilling operations and their wells contaminated with spills and gas leaks. Rivers, streams, ponds and wetlands are not protected by setbacks in 560.4 - other than via the 100 year floodplain, which is ill-defined and is not sufficient protection for some water bodies. Most New York water sources remain unprotected by the proposed regulations. The simplest way to respond via snail mail is to find topics that you are interested in on this site. Comments will be accepted on the draft regulations from December 12, 2012 through 5:00 PM on January 11, 2013. You can submit comments on the web at the New York State High-Volume Hydraulic Fracturing Comments page of the DEC's website. The online response categories are very limited - they do not address material HVHF issues, such as allowing horizontal laterals to be run under lakes and rivers. We will update summaries of responses to the online categories as soon as the online form becomes available. Use the responses shown below as a guide for your own response. Do no simply copy them without adding your own input. 2. Log on and pick from one of the online categories to respond to, then return to this Fracking Regulations page. 3. Find the response to that category from the list below. 4. Copy and paste that example response into the DEC's response form. Edit and amend the response with your own thoughts and input. 5. Add additional references pertinent to the category, then hit "Submit Comment"
6. Submit a comment to another category by repeating the steps above. 7. Print your responses, sign them and mail a copy in to the DEC. If you would like pdf or Word doc. copies of these responses, send me an email northrup49@gmail.com. A new loophole in the regulations would allow drilling horizontal laterals under all New York lakes except the New York City Reservoirs. It would allow shale gas wells to tunnel under most rivers and trout streams in the state. This means that many lakes in New York could be ringed with gas wells - within 2,000 feet from major lakes and zero from minor ones. See below, 52.3 Prohibitions, italics and bold last sentence. This means that a horizontal shale well could be drilled under Lake Cayuga, Lake Otsego, etc., so long as the well pad was 2,000 feet away from the shore. This loophole means that shale gas wells could tunnel under most major rivers in the state, including the Hudson, Fishkill, Mohawk, Battenkill, Housatonic, Salmon, etc. Rivers would be contaminated and gassed more readily than lakes, since the setback is less. No horizontal hydrofracking should be allowed under state controlled lakes, rivers or streams. (2) 'State lands' shall mean all real property interests owned by the State of New York under the Department's jurisdiction that are administered by the Division of Fish, Wildlife and Marine Resources, including but not limited to such lands designated as wildlife management areas, multiple use areas, unique areas, natural resources management areas, fishing access sites, boat launch sites, hatcheries, game farms and tidal wetlands. Most state parks are not covered by this definition. The key phrase is 'not limited to' which would include most lakes, rivers and streams in the state. Notwithstanding any other provision of this title, surface disturbance associated with the drilling of a natural gas well subject to Part 560 of this Title on State lands is prohibited and no permit shall be issued authorizing such activity. This prohibition shall apply to any pre-existing leases and any new leases issued for oil and gas development on State lands. This prohibition shall not apply to subsurface access to subsurface resources located under State lands from adjacent private areas." The loophole in the last sentence means that a driller could lease private land next to a state owned lake, river or stream and simply tunnel under it. The loophole should be closed and no laterals allowed under state lakes or rivers. This section does not apply to state parks, which are administered by the State Parks dept. A loophole in the new regulations would allow shale gas laterals to run under state lands and forests." Since there is no setback from property lines, the well pads could be located right at the park entrance. The lateral section of such a well could easily run up to a mile into a state land or forest. This means that New York state lands or forests could be ringed by drilling sites. The proximity of those wells would make it highly likely that groundwater, wetlands and streams would be contaminated with methane inside the forests. Drilling of laterals should not be allowed under state lands or forests. a. Except as otherwise provided, the provisions of this Part shall apply to all persons entering upon or using State lands under the department's jurisdiction that are administered by the Division of Lands and Forests, the Division of Operations, or both, including but not limited to such lands as unique areas, State forests, reforestation areas, multiple use areas, forest preserve, conservation areas, natural resource management areas, preserves, campgrounds and environmentally sensitive lands, and to those rights owned and managed by the State as conservation easements as defined in section 190.12 of this title." (ag) Notwithstanding any other provision of this title, surface disturbance associated with the drilling of a natural gas well subject to Part 560 of this Title on State owned lands is prohibited and no permit shall be issued authorizing such activity. This prohibition shall apply to any pre-existing and new leases issued for oil and gas development on State owned lands. This prohibition shall not apply to subsurface access to subsurface resources located under State owned lands from adjacent private areas." The last line should be dropped. It is simply a loophole to run laterals under state parks and forests from outside their boundary. This would mean that state forests could be ringed by drilling rigs and gas wells. Those gas wells can contaminate groundwater inside the state park and forest. The DEC proposes to give the well permitting group, Minerals Resources, environmental oversight over the drilling it authorizes. In most states, the environmental agency is separate from the minerals management (well permitting) agency. In New York, there is no autonomous environmental oversight over oil and gas drilling. The oil & gas agency regulates itself. The environmental regulatory mission is simply reduced to the cleaning up pollution the DMR has enabled and facilitated. Meaning, cleaning up the mess that it makes by issuing permits under these asinine regulations. The DMR cites no studies, no reports, no science as the basis for any of its proposed regulations. (a)To carry out the functions outlined in section 550.1 of this Part, the Department of Environmental Conservation has created a Division of Mineral Resources. (b)The Division of Mineral Resources is headed by a director who is responsible for the administration and enforcement of all rules, regulations, orders and amendments thereof of the Department of Environmental Conservation relating to the exploration and drilling for, and production, transportation, purchase, processing and storage of oil and gas and other wells regulated under Environmental Conservation Law Article 23, and the prevention of any pollution resulting therefrom." Tasking Mineral Resources with environmental oversight completely compromises the DEC's effectiveness as an environmental protection agency. Environmental oversight should be done by a separate division within the DEC or MInerals Resource should moved out of the DEC.
No state agency is prepared to address the regulation and taxation of shale gas industrialization. Not the DEC, DOT, DOH, AG or Comptroller's Office. The DEC does not have the manpower to issue the permits effectively, nor does it have the manpower (or incentive) to monitor the activity. As written, the plugging liabilities have two major loopholes - one as to depth, the other as to cumulative liability. Both loopholes must be closed or the number of orphaned wells in the state will increase. The bonding requirements to plug and abandon a well only apply to wells that are 6,000 feet or more in depth. All unplugged and abandoned wells will leak. The shorter ones may leak sooner and more than the longer ones. There should be a plugging bond for every well drilled. No exceptions. The 2012 removes the plugging liability cap, by allowing Mineral Resources to set any amount - or no amount, which is no standard at all. §551.5 Amount of financial security: For wells up to 6,000 feet deep, the plugging liability never exceeds $5,000 per well, and is capped to no more than $150,000 for the operator, regardless of the number of wells. This amount would not cover the engineering costs, much less the plugging costs of most wells. The full cost of plugging the well should be determined at the time of permitting and a performance bond posted on every well. The owner of an oil , gas or solution mining , storage, stratigraphic, geothermal or disposal well that exceeds or that is expected to exceed 6,000 feet in true measured depth must file financial security for that well in an amount based upon the anticipated costs of plugging and abandoning that well to the satisfaction of the department in accordance with Part 555 of this Title, up to $250,000. However, the owner is not required to file financial security under this section exceeding $2,000,000, regardless of the number of wells described in this section that the owner may have." 2012 Section 551.6 Wording removes both the $250K and $2M caps, and replaces it with "an amount specified by the department," which is not an objective standard. The plugging liability should be estimated well by well by an independent firm, and bonded by a reputable company, not set by these arbitrary standards that may not be right now and won't be right years hence when the wells have to be plugged. The owner of an oil, gas, solution mining, storage, stratigraphic, geothermal or disposal well that exceeds or that is expected to exceed 6,000 feet in true measured depth must file financial security for that well in an amount based upon the anticipated costs of plugging and abandoning that well to the satisfaction of the department inaccordance with Part 555 of this Title. However, the owner is not required to file financial security under this section exceeding an amount specified by the department, regardless of the number of wells described in this section that the owner may have." In plain English, there is no objective standard for the amount of the plugging liability - which only applies to wells deeper than a mile. (o)'Director' shall mean the director of the Division of Mineral Resources of the Department of Environmental Conservation." The DEC is proposing to make the Division of Mineral Resources (DMR) responsible for environmental oversight over shale gas industrialization. The DMR's record of environmental stewardship is abysmal. A comment period of 30 days is inadequate to address the impacts involved. The DEC cannot mask its lack of preparedness and lack of resources by rushing the regulations. Proposing new regulations before the dSGEIS review is complete is simply irresponsible and probably illegal. 5. Strict liability applied for damages, with appropriate bonding. So when a gas well contaminates a water supply, the driller is liable. In New York, wells are permitted one at a time, in isolation, see 552.1 (a) - when in practice, HVHF wells are drilled in multiple well programs. The industrialization entails the construction of an infrastructure of gas gathering systems, gas processing plant, and compressor stations - none of which are addressed in these regulations. In other states, the operator is required to submit their proposal for the entire project - all the wells they intend to drill with infrastructure. Failing to address the entire industrial infrastructure of multiple HVHF well programs is grossly irresponsible. The DEC's approach missess the industrialized forest of shale gas for the trees of individual wells. As proposed, the only new requirement necessary to get a drilling permit is to demonstrate that the proposed well is at least a mile away from another well - to prevent the frack from turning the existing well into a geyser. This one mile setback is the largest on the regulations. Mineral Resources is more concerned about fountaining an old well than in protecting people or the environment. Nothing new is taken into consideration - not water features, not steep slopes, not existing land uses. The survey requirements in 552.1 (b) are for mineral rights, surface property boundaries are ignored. No new requirements for HVHF are mentioned. This is indicative of the fact that, in the dual role the DEC has taken on, the environmental mission is secondary. (b) Each copy of the application must be accompanied by a neat, legible plat which has been certified as to correctness by a licensed land surveyor or licensed civil engineer. The plat must be drawn to scale and show the boundaries of the lease or unit containing the well, the distance in feet from the well to the two nearest boundaries, the distance in feet from the well to the nearest plugged and abandoned well [completed in the objective pool] subject to Part 552 (if same is within one mile) and the distance in feet from the well to the nearest producing well (if same is within one mile). " * Well spacing and setback of wells from spacing unti boundaries were dictated to the DEC staff by Chesapeake Energy's lobbyist. When the DEC refers to "correlative rights" they are referring to rights between subterranean mineral rights owners - not surface property rights. This lack of protection will negatively impact surface property values near drilling. The initial well spacing of 640 acres for horizontal wells can be reduced by the DEC down to 40 acres. It is axiomatic that as an oil or gas field is developed, the well spacing decreases, so the 640 acre spacing for horizontal wells is likely to decrease in some area, meaning more well pads on increasingly tighter spacings. A shale gas well can be right next to any unprotected surface use - a livestock pond, a creek, organic farm, or a vineyard - since property lines are ignored by well setbacks. (7) For shale gas pools at any depth, for a horizontal well outside any existing spacing unit for the same formation and in the absence of a written commitment from the well operator to drill infill wells pursuant to subdivision (c) of this section, 40 acres with the wellbore within the target formation no less than 330 feet from any unit boundary plus the number of additional acres necessary and sufficient to ensure that the wellbore within the target formation is not less than 330 feet from any unit boundary;"
The setbacks are for subsurface rights, mineral rights in spacing unit boundaries, not surface rights, property lines, structures or the environment. The risk to adjacent properties and to the environment of run off, spills and gas migration are a function of distance, hydrology and topography, not well depth. (11) For all other gas pools where the majority of the pool is below 8,000 feet, within five percent of 640 acres with the wellbore within the target formation no less than 1,500 feet from any unit boundary, plus, if applicable, the number of additional acres necessary and sufficient to ensure that any horizontal wellbore within the target formation is not less than 1,500 feet from any unit boundary;"
Well setbacks should be determined from surface property lines, in addition to the subsurface mineral rights of spacing unit boundaries. Under 553.4, The DEC can grant variances on the proposed well spacings - and inevitably, it will, meaning more well pads closer together, not fewer farther apart. This is a textbook argument for local controls over land use. By reviewing each HVHF permit in isolation, 554.1 (c) the DEC effectively ignores the cumulative industrialization of multiple wells, gathering lines, processing plants and compressor stations. While requiring that the well permit applicant furnish a plan to show how waste is disposed of, there is no objective standard proposed as to what "ultimate disposition and/or disposal" consists of. In most states, that would mean put into an disposal well. But since there are no disposal wells in New York, the proposed regulation is unworkably vague. Indeed, the word "disposition" has been added, since "ultimate disposal" in New York may not be feasible. Moreover, the proposed regulations suggest that the disposition is merely a function of the "sensitivity of the surrounding environment to the polluting fluids" ie. the frack waste - implying that "ultimate disposition/ disposal" could consist of dumping the frack waste on-site. Since there is no objective standard regarding the "disposition" of frack waste, the wording is so vague as to be meaningless, hence unenforceable. Likewise, there is no objective standards required for the disposal or re-use of drill-cuttings from shale, which are radioactive. The language in 554.1. (c) (1) mentions "a plan" for the disposal of radioactive drill cuttings which Mineral Resources deems "environmentally safe" - which is so vague as to be meaningless. Subdivisions (a) and (b) of Section 554.1 are unchanged. (1) Prior to the issuance of a permit to drill, deepen, plug back or convert a well, or for any operation reported to the department on the Sundry Well Notice and Report form that requires pre-approval from the department the owner or operator must submit and receive approval for a plan for the environmentally safe and proper ultimate disposition and/or disposal of used drilling mud, flowback water and production brine . The owner or operator must state in its plan that it will maximize the reuse and/or recycling of used drilling mud, flowback water and production brine to the maximum extent feasible. Before approving a plan for disposition and/or disposal of such fluids, the department will take into consideration the known geology of the area, the sensitivity of the surrounding environment to such fluids , and the history of any other drilling operations in the area. Depending on the method or methods of disposal chosen by the owner or operator, a permit for discharge and/or disposal may be required by the department in addition to the permit to drill, deepen, plug back or convert a well. An owner or operator may also be required at the department's discretion to submit an acceptable contingency plan, the use of which shall be required if the primary plan is unsafe or impracticable at the time of disposition or disposal. (4) If applicable, prior to the issuance of a permit to drill, deepen, plug back or convert a well or for any operation noticed to the department on the Sundry Well Notice and Report form that requires pre-approval from the department, the owner or operator must submit and receive approval of a plan for the environmentally safe and proper disposal or beneficial re-use of drill cuttings on-site or off-site." The state has thousands of orphan wells that are not plugged. The DEC is incapable of addressing this problem. Revising regulations that the DED does not enforce is an exercise in deceptive practices. As a practical matter, plugging only works on oil wells - since it keeps oil, which is lighter than water, from rising up the water in the casing. Gas wells vent around the plug in the well bore itself, rendering them useless over time. All gas wells leak - it is just a matter of when and how much. The only way to prevent gas wells from contaminating groundwater is via adequate setbacks. (a) It shall be unlawful for the owner or operator to shut in a well for more than one year without specific permission from the department for an extension of the time period during which shut-in is permitted. In order to keep from having to plug a well, operators will register them as "shut in" - and leave them on the "shut in" list until they are abandoned. (1) The well bore, whether to remain cased or uncased, shall be filled with cement from total depth to at least 50 feet above the top of the shallowest formation from which the production of oil or gas has ever been obtained in the vicinity. Alternatively, a bridge topped with at least 50 feet of cement shall be placed immediately above each formation from which the production of oil or gas has ever been obtained in the vicinity. (2) For any casing [is to be ]left in the ground, a cement plug of at least 100 feet in length shall be placed 50 feet below and 50 feet above the casing shoe . Uncemented casing must be cut and pulled as deep as practicable with a plug approximately 50 feet in length placed in and above the stub of the casing. If the uncemented casing is unable to be pulled the casing must be perforated 50 feet below the shoe of the next outer casing and a 100-foot plug placed across that shoe. A 50 foot plug shall be placed at the surface. This refers to pouring cement (ie.plaster) into the steel tubing. That will not prevent gas from venting up on the outside of the casing. After the steel tubing rust, it won't prevent gas and pollutants from coming up into groundwater. Briny wells can rust out fairly quickly. Conversely, plugging the casing may in fact work on an oil well - since the oil is apt to be contained inside the casing, until the casing rusts out. (3) If casing extending below the deepest potable fresh water level shall not remain in the ground, a cement plug of at least 50 feet in length shall be placed in the open hole at a position approximately 50 feet below the deepest potable fresh water level. This Implies that by pouring un-reinforced cement (plaster) down the open hole (after the casing has been pulled) is going to keep gas from venting up around that "plaster plug". This will not work over time since the cement will not adhere to the greasy, broken remains of the well wall - and as it cures, it will shrink away from the well wall. It is a stop gap measure that will not keep pollutants from coming up the water column that will fill the gaps in hole. Plugging works for awhile on an oil well. It will not work at all on a well that vents gas. (4) If the conductor casing or surface casing is drawn, a cement plug of at least 50 feet in length shall be placed so that the top of the plug is immediately below the point where the lower end of the conductor or surface casing shall previously have rested (i.e., the casing seat) . The hole thereabove shall be filled with cement, sand or rock sediment or other suitable material in such a manner as will prevent erosion of the well bore area and not interfere with normal soil cultivation." This refers to plugging an open hole, after the topmost steel tubing is pulled. The problem with plugging gas wells is that the cement, whether it is placed inside the casing (the steel pipe), or if the casing is pulled, in the wellbore (the hole) itself will crack, shrink and begin to leak gas up into the groundwater. As oils separate out of the water that will fill the wellbore, they wil rise in the water column. After that, the steel casing will begin to leak. 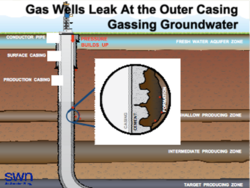 In summary, the casing may prevent the well from leaking gas and pollutants for a relatively short period of time. In a xeric environment, that would be less of an issue than in Upstate New York, given the hydrology and the dependency of 6 million people on shallow water wells. On the contrary, some practices would clearly put the public in jeopardy, 556.2 (a) (b) allow venting of gas wells for days. The venting of noxious gases at the well site is not adequately addressed. More often that not, waste gases - which contain radon, etc. are vented at the well bore, not necessarily flared. The proposed regulations would allow gas wells to vent raw gas for up to 48 hours after completion, plus "48 hours" after stimulation (fracking), 48 after workovver,plus 24 hours test, plus more escaped gas "used in any operational requirements"
So 48 + 48 + 48+ 24 hours = 168 hours or 7 days of venting raw gas, plus an indeterminate length for "any operational requirements" which could be anything. So much for "green completions." Given the lack of setbacks proposed in 560.4, this should be sufficient to gas school children, cattle, etc. (a) The operating practice requirements of subdivisions (b) through [(d)] (g) of this section shall be applicable only to gas wells. (b) No gas from any gas well, except such as is produced in a clean-up period not to exceed 48 hours after any completion or stimulation operation or workover , plus that used for the controlled testing of the well's potential in a period not to exceed 24 hours, plus that used in any operational requirements, shall be permitted to escape into the air. (c) The release or flaring of gas, to the extent permitted by subdivision (b) of this section, shall be performed in accordance with a flare approval issued by the department. Application to the department for a flare approval, extension of an approved flaring period or for an extension of the time periods specified in subdivision (b) of this section shall be made on the Sundry Well Notice and Report form." 560 Horizontal Shale Well Regs. Other states require the operator to submit their entire drilling program for review - by field or basin. The DEC only looks at one well at a time, ignoring cumulative impacts. This means that the DEC ignores the cumulative industrialized impact of multiple HVHF wells in 560.3 (a), since it does not see them at the same time. The DMR ignores the cumulative impact of the HVHF infrastructure. Because the proposed HVHF regulations do not address the infrastructure of gas gathering lines, gas field processing plants or gas field compression stations. Shale wells that are fracked with less than 300,000 gallons are exempt from these new regulations. They revert to the original 1972 regulations. (14) 'high-volume hydraulic fracturing' shall mean the stimulation of a well using 300,000 gallons or more of water as the base fluid in the hydraulic fracturing fluid per well completion. In determining whether the 300,000 gallon threshold has been met, the department will take into account the sum of all water-based fluids, including fresh water and recycled flowback water, used in all high-volume hydraulic fracturing stages." HVHF definition -- DEC only defines HVHF as fracking with volumes above 300,000 gallons, which means that the old regs (written for volumes less than 80,000 gallons) would govern any horizontal well below this threshold. This loophole would permit open flowback pits, etc. Most wells setbacks from surface features depend on whether a HVHF general permit or SPDES permit is used. Requiring mapped distances to principal aquifers (500ft), wetlands (300ft), and perennial/intermittent streams (300ft) only apply for a HVHF general permit. All setbacks appear to be negotiable for SPDES permits. The 300,000 threshold could be easy to 'game' since the well could be permitted as a short section of a horizontal at 299,999 gallons, completed, then permitted as a re-completion to lengthen the lateral with another 299,999 gallons, in the way the water withdrawal regulations were written to be easily gamed. (5) scaled distance from the proposed surface location of the well and the closest edge of the proposed well pad to any water supply reservoir, water well or domestic-supply spring within 2,640 feet, including any public or private wells, community or non-community systems;"
2,640 feet might be an adequate setback from water sources. There is no science to indicate anything less. "(6) scaled distance from the proposed surface location of the well and the closest edge of proposed well pad to any primary or principal aquifer boundary, perennial or intermittent stream, wetland, storm drain, lake or pond within 660 feet, and any surface water body within 660 feet that is a tributary to a public drinking water supply;"
Many of these water bodies, such as wetlands, have few or no specific protections in the regulations. "(8) identification of water wells and domestic supply springs within 2,640 feet of proposed surface location;"
'Identification' simply means you give Mineral Resources a map with your permit application. This might be an adequate setback depending on the hydrology. "(9) identification of any abandoned wells subject to Parts 550 through 559 of this Title within the proposed spacing unit and within one mile of the proposed surface location;"
This refers to abandoned oil or gas wells. It is the largest distance referred to in the regs. "(15) a drill cuttings disposal plan, as required by paragraph 554.1(c)(4) of this Title." Drill cuttings from shale are radioactive. No objective standard is proposed for their final disposal. "(20) a transportation plan indicating the planned route for delivery of raw materials and chemical additives to the site, the proposed route for transport of waste materials and an estimated number of truck trips associated with same." A plan is not a standard. This is a strong argument for local road use ordinances. "560.3 (d) Hydraulic Fracturing Fluid Disclosure (2) The department will disclose to the public the information submitted pursuant to paragraph (1) of this subdivision except that operators or other persons who supply information subject to paragraph (1) of this subdivision may request such records to be exempt from disclosure as provided by Part 616 of this Title. Records determined by the department to be exempt from disclosure shall not be considered a well record for purposes of disclosure." All fluids used in fracking should be publicly disclosed. The Division of Mineral Resources is not a reliable steward of the public's health. The proposed regulations ignore most surface uses and all property lines. A well could be drilled next to a warehouse, office building, factory, or daycare center.Or adjacent to a school yard, next to a public park or inside a state park, since there is no prohibition against it. This is an compelling argument for local land use ordinances. There is no scientific evidence to indicate that a 500 foot setback will be sufficient to keep a water well from being gassed. If the resident does not own the mineral rights (such as a tenant or "split estate") the horizontal lateral could go right under the water well ! As "Place of assembly" is usually defined, there is no gas well setback from an office building, a school yard, playing field, public park, etc. There are no setback from property lines. The "spacing unit" setbacks for a well are based on the mineral rights - not the surface rights. So if the the surface owner does not own the mineral rights, the well setback for the spacing unit could be on their property. The proposed setbacks are at the low end of the range in the US. Note that the 100 year floodplain needs to be updated in most of New York state http://www.scribd.com/doc/119018751/Setback-Floodplains. (5) within 2,000 feet of any public water supply (municipal or otherwise, or the boundaries of any public water supply reservoir, natural lake or man-made impoundment (except engineered impoundments constructed for fresh water storage associated with fracturing operations) . (b) All distances noted above are measured from the closest edge of the well pad. Those are included in a "well site : (31) 'well site' shall mean the well pad and access roads, equipment storage and staging areas, vehicle turnarounds, and any other areas directly impacted by activities involving a well subject to this Part. (c)The department may permit reasonable well location variances to the setback requirements in sections 560.4(a) (1), 560.4(a) (2) and 750-3.3 (a)(6) of this Title." None of these setbacks are adequate, none of them will prevent New York drinking water sources from being gassed with methane and polluted with spills. The DEC cites no study to show why they believe a 500 foot setback would be adequate from a residential water well. There are no scientific studies of methane migration to definitively conclude that 500 feet would be adequate to prevent such wells from being gassed. On the contrary, the only scientific studies on this, indicate a setback of a kilometer would be appropriate. 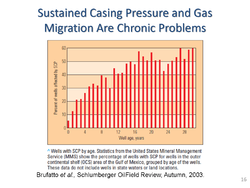 There are a few papers that seek to deny or obfuscate the problem that gas wells vent into groundwater as they age. 100 Year Floodplain - as recent events have shown, "100 year floodplains" are routinely flooded about every 5 years now. So this needs to be increased to the 500 year floodplain. § 560.5 Testing, Recordkeeping and Reporting Requirements. (1) prior to well spud, the operator must make all reasonable attempts to sample and test residential water wells within 1,000 feet of the well pad for the parameters specified by the department. If no wells are available for sampling within 1,000 feet of the well pad, either because there are none of record or because any property owners within 1,000 feet of the well pad deny the operator permission to sample their wells, then the operator must make all reasonable attempts to sample and test water wells within 2,000 feet for the parameters specified by the department. The owner of any water well tested must be provided with a copy of the test results within 30 days of the operator's receipt of the results." Open pits are allowed of up to half a million gallons of fluids, including fluids that are "other than fresh water". Since there are requirements for tank storage of fracking flowback and drill cuttings, the definition of what may be stored in open pits needs to be clarified. No drilling fluids "mud" should be stored in open pits, since the DEC proposes no standards for drilling fluids, which can be as toxic as frack fluids. 560.6 Well Construction and Operation. Open pits are allowed for drilling mud on any well except a horizontal Marcellus Shale well (560.6 C 7 i). Meaning a Utica Shale well can be drilled with open pits. This section has been eliminated: (viii) for pits used to hold other than fresh water, at least two feet of freeboard must be maintained at all times. (viii) The requirement to maintain 2 feet of freeboard has been eliminated, meaning an open pit can be filled to the brim. (ii) any drilling requiring cuttings to be disposed of off-site." Meaning any other horizontal shale wells can be drilled with open pits. And radioactive drill cuttings can be dumped in open pits on site. "(13) Intermediate casing must be installed in the well. The setting depth and design of the casing must be determined by taking into account all applicable drilling, geologic and well control factors. Additionally, the setting depth must consider the cementing requirements for the intermediate casing and the production casing as noted below. Any request to waive the intermediate casing requirement must be made in writing with supporting documentation and is subject to the department's approval. Information gathered from operations conducted on any single well or the first well drilled on a multi-well pad may be considered by the department upon a request for a waiver of the intermediate casing requirement on subsequent wells in the vicinity of the single well or subsequent wells on the same multi-well pad." (24) Diesel fuel may not be used as the base fluid for hydraulic fracturing operations." This is meaningless, since water is the base fluid of fracking. See 560.2 "(3) 'base fluid' shall mean a substance, such as water or recycled flowback water, into which additives are mixed to form the hydraulic fracturing fluid which transports proppant, if used." The use of diesel fuel and all other toxic chemicals should be prohibited, not simply disclosed. The major comment on 750 is 750.3.3 (a) - the carve out of the New York City drinking water from fracking. The protections proposed by the DEC are almost purely political - driven by the number of voters effected. From New York City down to the local farmer. There Is No Way to Both Economically and Environmentally Dispose of Billions of Gallons of Frack Waste In New York. There are no "ultimate disposal" options available for the billions of gallons of radioactive and toxic frack waste that would be created by fracking shale. Tracking fracking flowback is rather pointless if there is no place to actually dispose of the frack flowback or the effluent sludge from processing fracking flowback. And there are no disposal wells in New York, so there is literally no place to get rid of the raw frack flowback, and few landfills to get rid of the processed sludge - without contaminating groundwater. Fracking flowback and produced water have already been dumped in New York municipal treatment plants. Produced water has been dumped on New York roads as "de-icer" - which would be illegal in most states. (a) All HVHF wastewater must be treated, recycled, or otherwise properly disposed through the life of the well in accordance with all applicable federal and state laws. (b) The discharge of flowback to the ground is prohibited. The discharge of drilling fluids, formation fluids and production brine to the ground is prohibited, except in accordance with the terms and conditions of B.U.D. (Beneficial Use Determination)."